The new car is so far removed from its predecessors that Honda could have changed the name. But Civic it is, and it’s the best one yet. Nine generations of Civic have failed to set the UK's collective pulse racing, despite Honda trying everything to make it work. There have been frighteningly sensible models, radically futuristic models, five-door models, coupes, big engines, little engines, imported models, and more. None of them have come close to the likes of the Ford Focus, Volkswagen Golf or Vauxhall Astra in terms of sales or leasing (although what does?) and so Honda has gone back to the drawing board. This tenth generation model is very much a clean-sheet design then, intended to separate the car from everything that has gone before and create a model that has been carefully calculated to compete with the segment leaders. It looks every bit as radical as the last two generations, but where revolution was name of the game over recent years, now it’s more a case of under-the-skin evolution. 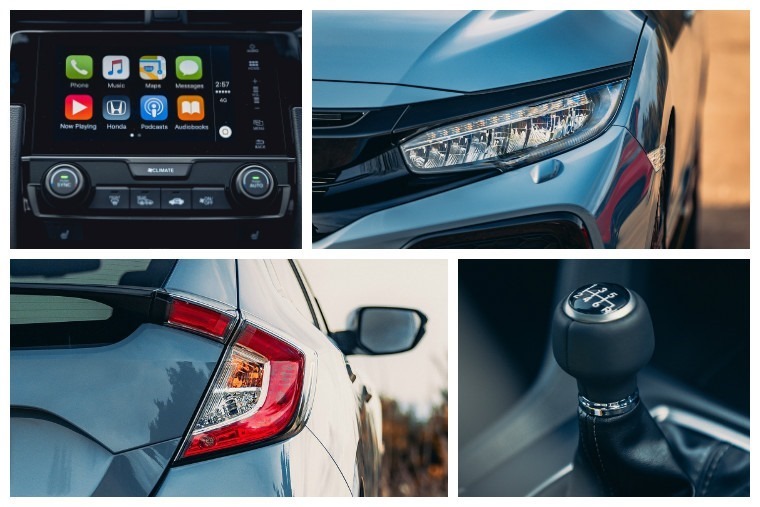 One third of Honda’s research and development budget has gone into this new car, which demonstrates just how seriously this Civic is being taken, so anything other than success would be devastating. Fortunately, first impressions are good as the new car is longer, wider, lower and lighter than the car it replaces, that translates into immediately impressive ride and handling qualities. On the motorway it’s particularly smooth and quiet. There’s fully independent suspension at the rear that makes it feel stable, while also aiding agility. Body control is pretty good too, with little roll. This result is a car that can be driven with enthusiasm without fear of the chassis letting the side down. 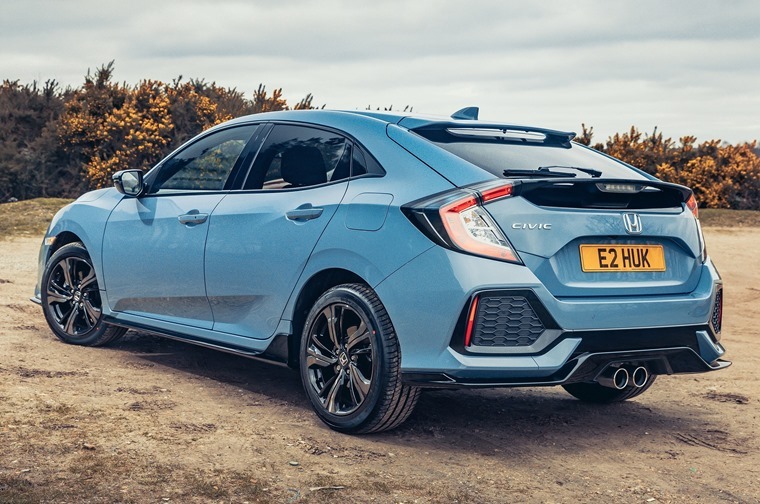 Pleasingly, this isn’t at the expense of comfort as new dampers and springs allow the Civic to remain planted on rougher roads. On the motorway it’s particularly smooth and quiet, although there is a fair bit of tyre roar. Power is provided by a brace of new engines; there’s a tiny 1.0-litre engine available that’s one of the most powerful three-cylinder engines available, offering impressive acceleration and class-leading refinement. This is expected to be the most popular unit, but my test car has the 1.5-litre turbocharged petrol, and it’s an equally excellent unit that produces a handy 182hp, with a short-throw six-speed gearbox encouraging the driver to keep that turbo spinning. 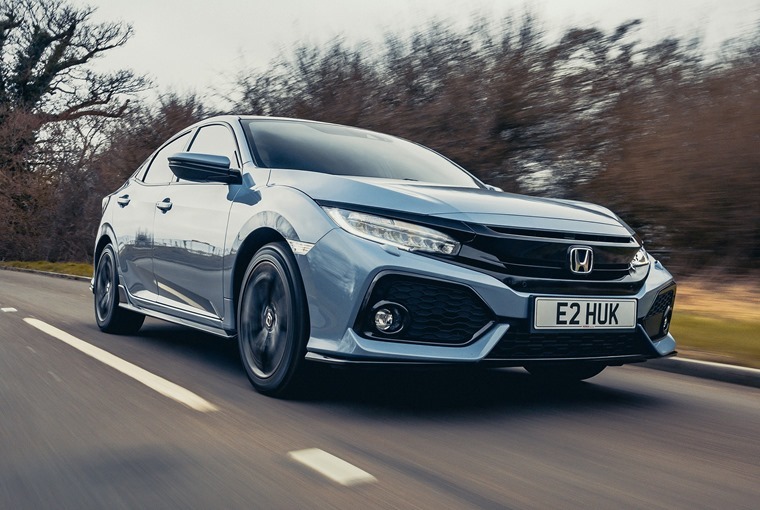 There’s no diesel option for now, but this isn’t a knee-jerk reaction to the current anti-diesel rhetoric as the superb 1.6-litre i-DTEC engine will be fitted to the Civic before the end of the year. It goes and drives better, but sensible family motoring hasn’t been forgotten. 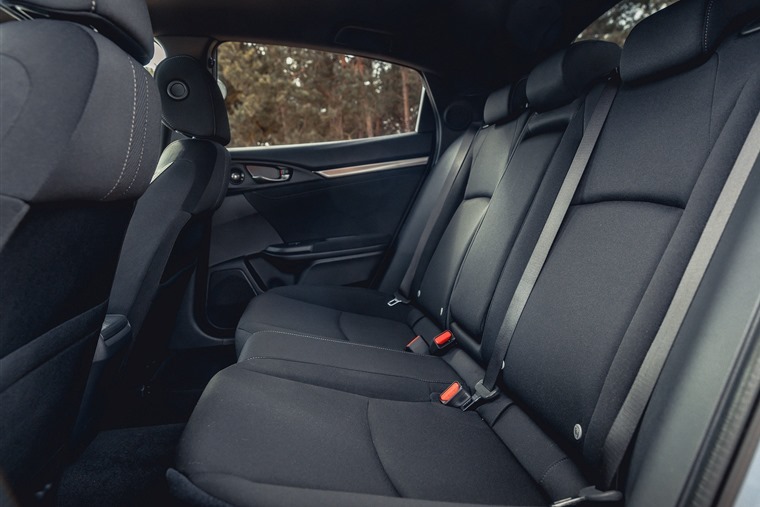 As you would expect from a car that’s grown in size, there’s more room in the interior with plenty of space for adults up front. Those in the rear might find the swooping roofline robs them of some headroom, but kids will be fine and there’s lots of legroom to shuffle around in. The boot will hold a class-leading 478-litres of pushchairs, coolboxes and shopping, although it’s not quite so generous compared to its rivals when the rear seats have been folded down. Sadly the innovative Magic Seats that folded in various ways to leave a cavernous and flat load area have been sacrificed in the name of driving dynamics. 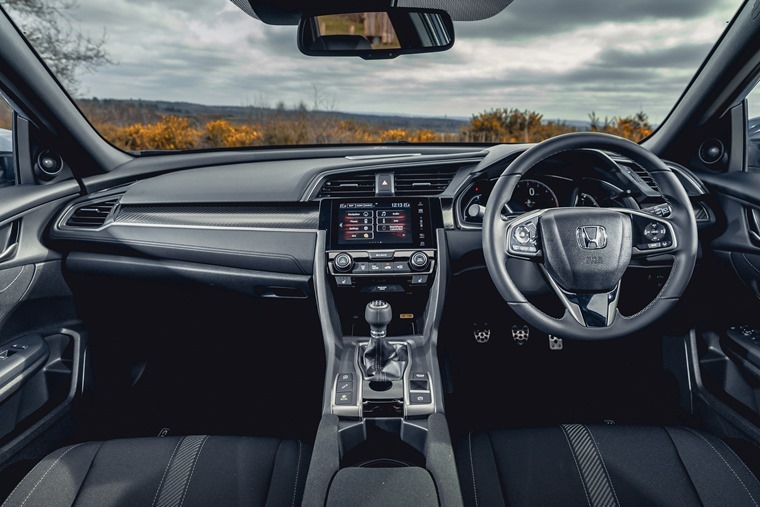 In return, Honda has added a space-saving parcel shelf that rolls away to the side, a deep centre storage unit made larger thanks to Honda switching from a traditional handbrake to a compact electronic one, and a wireless charging pad to power mobile phones that can cope with the technology. Sport trim gets funky 17-inch alloy wheels and sporty twin centre exhausts. Beyond that, standard kit is generous. The mid-range models get dual-zone climate control, auto wipers and lights, and a touch screen infotainment centre that includes Android Auto and Apple CarPlay connectivity. Sport trim gets funky 17-inch alloy wheels and sporty twin centre exhausts, although these do rob the boot of its under floor storage. It’s a shame that all of this equipment is bundled in a dashboard that, while looking quite stylish, is constructed from hard, shiny plastics that feel far cheaper than the rest of the car. All that budget obviously went on engineering rather than perceived quality. 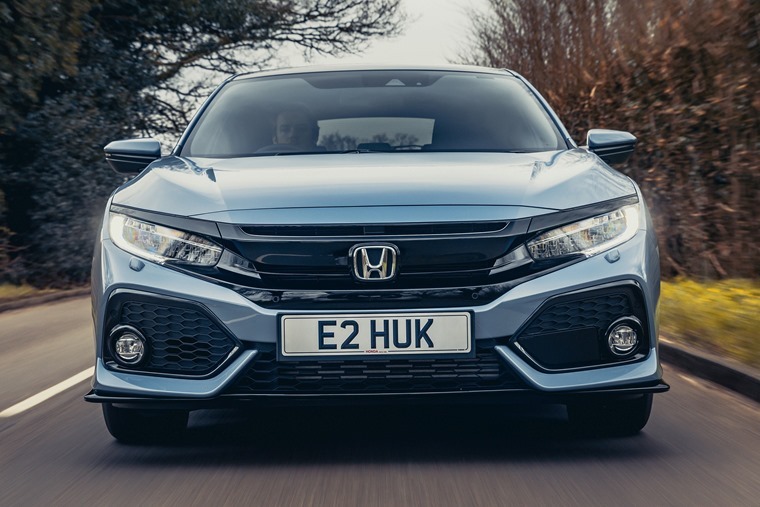 That’s just a small irritation on what is otherwise an excellent effort, as the Honda is great to drive, comfortable, spacious, reasonably frugal, refined, practical and good value - good enough to compete with the very best hatchbacks on sale.